Albert was the eldest son of the count of Bollstädt and heir to that title. Despite the strong opposition of his family, he became a Dominican in 1222. Teaching and studying at various universities, Albert soon developed a widespread reputation for his learning and intellect. He received his doctorate from the university at Paris in 1245 and became the regent of a new school established in Cologne in 1248. Among his students was Thomas Aquinas, whose genius Albert early recognized and proclaimed. The two became close friends. Albert was named provincial of his order in 1254. On a journey to Rome to defend the Dominicans against attacks, he served as personal theologian to the pope. In 1257, he resigned this position to continue his teaching and studies. 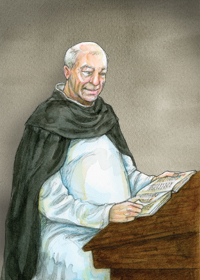 Together with Thomas Aquinas and others, Albert drew up a new study curriculum for Dominicans. Against his wishes, Albert was named bishop of Regensburg in 1260, but resigned two years later to return to teaching and writing at Cologne. He was very active in the Council of Lyons in 1274, working toward uniting the Greek Church with Rome. In 1277, he fiercely and brilliantly defended Thomas Aquinas against the bishop of Paris and a group of theologians there who were attacking Aquinas’ philosophical stand. One of the great intellects of the medieval Church, Albert was one of the first and among the greatest of the natural scientists. His knowledge of biology, chemistry, physics, astronomy, and geography (one of his treatises proved that the earth was round) was so encyclopedic that he was often accused of magic. He wrote on these subjects as well as on logic, metaphysics, mathematics, the Bible and theology. The writings of Albert the Great on all of these subjects fill thirty-eight volumes. His brilliance and intellect brought him the title “Universal Doctor,” conferred on him by his contemporaries. It was also his peers who dubbed him Albert the Great. St. Albert the Great was canonized and named a Doctor of the Church in 1931 by Pope Pius XI. He is the patron of scientists and philosophers. An optional Memorial honors this saint on November 15. Albert's message today: Since Albert's time, scientific breakthroughs have wiped out many diseases, improved living conditions for most of the world's peoples, and harnessed power unthinkable in his time. Expanding our knowledge in any field contributes to the betterment of the whole human race. Think of one or two ways that your knowledge can help better the lives of those in your community.